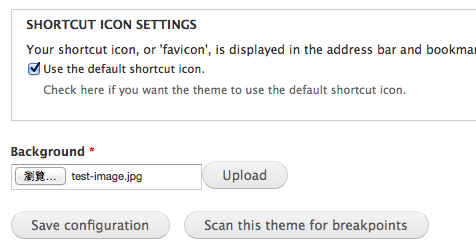 I want to upload the image as the background in the settings page of the zen theme. In zen , It's easy to add an extra field in the theme-settings.php and it's worked at the single site system. However,I want to add this feature to the domain access Website. And I got some error message. But when i push the upload button. Notice: Undefined index: system_theme_settings in drupal_retrieve_form() (line 806 of /Library/WebServer/Documents/official/includes/form.inc). Warning: call_user_func_array() expects parameter 1 to be a valid callback, function 'system_theme_settings' not found or invalid function name in drupal_retrieve_form() (line 841 of /Library/WebServer/Documents/official/includes/form.inc). Notice: Undefined index: var in variable_realm_form_system_theme_settings_alter() (line 618 of /Library/WebServer/Documents/official/sites/all/modules/variable/variable_realm/variable_realm.module). Notice: Undefined index: background_file in file_ajax_upload() (line 271 of /Library/WebServer/Documents/official/modules/file/file.module). Notice: Undefined index: #suffix in file_ajax_upload() (line 280 of /Library/WebServer/Documents/official/modules/file/file.module). and i really don't know how to fix that. I just referenced the content below and i can't find the answer. Is there a way to add managed_file field to theme-settings.php? Does someone fixed this situation before? The form needs to be able to find system_theme_settings() when getting rebuilt via ajax. form_load_include($form_state, 'inc', 'system', 'system.admin'); inside of theme-settings.php hook_form_system_theme_settings_alter() should do the trick. Not the answer you're looking for? Browse other questions tagged images theming theme-settings or ask your own question. How to set the file status of files uploaded through theme settings to permanent? How do I save a file with managed_file in a theme?